Essential oils are extracted from plants and have been used for millenia for physical, emotional and spiritual purposes. I've been using them for over 17 years for just about everything and always have them on hand. Aromatherapy is effective because the fragrances from the essential oils made from plants enter the olfactory and limbic systems. 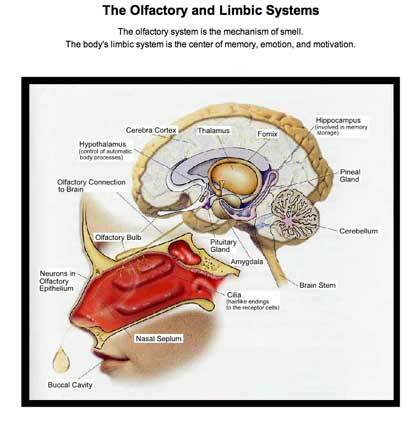 The limbic System includes the control and storage center for our memory and emotions. Each oil triggers different responses from the limbic system; from relaxing to invigorating, and some aromas trigger a romantic response and enhance libido. Here are scents that can enhance romance on your Valentine's day! Rose is one of the highest vibrating oils and is simply intoxicating! It balances hormones, supports the reproductive organs, and boosts feelings of sexual attraction and confidence. Ylang Ylang when it comes to essential oils, Ylang Ylang is considered to be the most powerful aphrodisiac. It is well known to increase energy, intensifying feelings, increases libido and attraction. Be sure to remember that a little goes a long way - too much can cause a headache or nausea. Jasmine Jasmine increases energy levels and brightens the mood causing a relaxed sensation. Jasmine is particularly helpful for men because it can be used rather dependably as a natural means of addressing many common performance issues. Patchouli is another well known aphrodisiac and an excellent oil for the skin making it ideal for romantic, Valentine’s Day activities like massages and bubble baths. Ginger is a warm scent that creates a feeling of safety, calm and connection with your partner; it also enhances libido. You can use these in a massage oil, putting just a few drops of the scented oil in a base massage oil like olive oil, jojoba, advocado or any other natural base massage oil. A few drops on your sheets or pillows will fill the bedroom with the warming aromas. A few drops put on like perfume (remember less is more when it comes to essential oils so just a drop will do) behind the ears, near the neck and torso. Or mix a few drops of the oils in a lovely scented bath to create your own scented Valentine's Day Spa! Feel free to forward this page to your Valentine. There are many good providers of essential oils however, quality is more important than quantity so be discerning. I prefer the therapeutic grade oils at Young Living, the premier manufacturer and distiller of therapeutic grade essential oils; they have distribution centers world wide so you can create your account with the center closest to you. You can visit Young Living online and when you place your order you will see a box to check indicating that you were referred by a distributor, please click this box and enter my sponsor number 77597, www.youngliving.com or feel free to contact me to order the oils.